Since the 1960s, immigration from the Korean peninsula to the United States has increased dramatically, driven by political, economic, and military relations between South Korea and the United States. In 2017, approximately 1 million Korean immigrants—the vast majority from South Korea, with just a tiny fraction from North Korea—resided in the United States, representing 2.4 percent of the 44.5 million immigrants in the country. After the Immigration Act of 1965 removed restrictions on Asian immigration to the United States, the Korean immigrant population grew significantly, from just 11,000 in 1960 to 290,000 in 1980, marking a 2,500 percent increase. In the following decade, the population nearly doubled to 568,000 and did so once again in 2010, when it reached a peak of 1.1 million immigrants. As of 2017, the Korean immigrant population had decreased by about 37,000 since 2010 (see Figure 1). There are now fewer incentives to emigrate, as political and economic conditions in South Korea have improved, and the South Korean government has attempted to attract return migration through increased economic and business opportunities. Contemporary Korean immigrants tend to be highly educated and of high socioeconomic standing compared to other immigrant groups and the overall U.S.-born population. South Korean students have consistently been among the top three largest groups of international students enrolled in U.S. higher education institutions, along with Chinese and Indian nationals. However, this population has decreased annually since the 2012-13 school year (SY), when 71,600 South Koreans were enrolled in U.S. higher education institutions. From SY 2016-17 to the following school year, the number of international students from Korea decreased by 7 percent, to 54,600 students. Source: Data from U.S. Census Bureau 2006, 2010, and 2017 American Community Surveys (ACS), and Campbell J. Gibson and Kay Jung, "Historical Census Statistics on the Foreign-born Population of the United States: 1850-2000" (Working Paper no. 81, U.S. Census Bureau, Washington, DC, February 2006), available online. 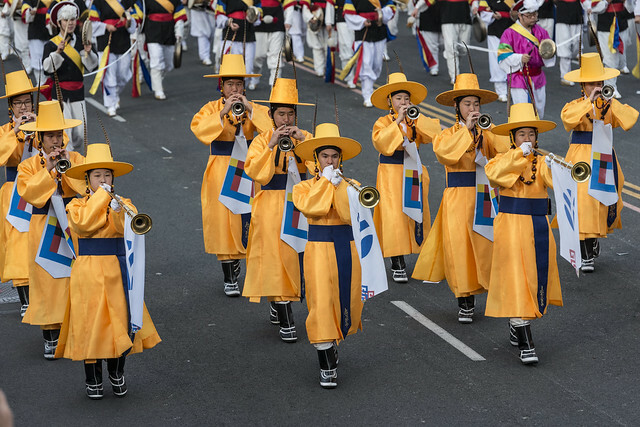 Although the Korean immigrant population in the United States has decreased over the past several years, the country is still home to the largest South Korean immigrant population in the world. Japan (593,000), China (191,000), and Canada (131,000) also have large populations of South Korean immigrants. Kazakhstan hosts the largest number of North Korean immigrants (63,000), followed by the United Kingdom (15,000), Russia (11,000), and the Philippines (6,000), according to mid-2017 estimates by the United Nations Population Division. Click here to view an interactive map showing where migrants from the Korean peninsula and elsewhere have settled worldwide. Most Korean immigrants in the United States are naturalized citizens, and those who have gained lawful permanent resident status (also known as a green card) have relied on sponsorship from an employer or immediate relative. Overall, compared to the total foreign-born population, Korean immigrants have higher incomes and educational attainment and are less likely to experience poverty or lack health insurance. However, they have lower workforce participation rates and are more likely to have limited English proficiency (LEP) than the overall immigrant population. Using data from the U.S. Census Bureau (the most recent 2017 American Community Survey [ACS] as well as pooled 2013-17 ACS data), the Department of Homeland Security 2017 Yearbook of Immigration Statistics, and World Bank annual remittance data, this Spotlight provides information on the Korean immigrant population in the United States, focusing on its size, geographic distribution, and socioeconomic characteristics. The terms foreign born and immigrant are used interchangeably and refer to those who were born in another country and later emigrated to the United States. Data-collection constraints do not permit inclusion of those who gained Korean citizenship via naturalization and later moved to the United States. In this Spotlight, Korean refers to immigrants from both North Korea and South Korea (based on the Census Bureau’s data tables). Given the small number of North Koreans in the United States, this Spotlight is more representative of South Korean immigrants. As of 2013-17, almost half of all Korean immigrants resided in three states: California (31 percent), New York (9 percent), and New Jersey (7 percent). The top four counties with Korean immigrants were Los Angeles County and Orange County in California, Bergen County in New Jersey, and Queens County in New York. Together, the four counties accounted for about 29 percent of the total Korean immigrant population in the United States. Note: Pooled 2013-17 ACS data were used to get statistically valid estimates at the state and metropolitan statistical area levels, for smaller-population geographies. Not shown are populations in Alaska and Hawaii, which are small in size; for details, visit the Migration Policy Institute (MPI) Data Hub for an interactive map showing geographic distribution of immigrants by state and county, available online. Source: MPI tabulation of data from U.S. Census Bureau pooled 2013-17 ACS. Click here for an interactive map that shows the geographic distribution of immigrants by state and county. Select Korea from the dropdown menu to see which states and counties have the highest distributions of Korean immigrants. In the 2013-17 period, 40 percent of Korean immigrants were concentrated in the greater metropolitan areas of Los Angeles, New York, and Washington, DC. Source: MPI tabulation of data from the U.S. Census Bureau pooled 2013-17 ACS. Click here for an interactive map that highlights the metropolitan areas with the highest concentrations of immigrant groups. Select Korea from the dropdown menu to see which metropolitan areas have the highest concentrations of Korean immigrants. In 2017, half of Korean immigrants (ages 5 and older) reported having limited English proficiency, compared to about 48 percent of the total foreign-born population. However, slightly more Korean immigrants reported speaking only English at home (19 percent) than the total immigrant population (16 percent). Korean immigrants have high educational attainment compared to the overall foreign-born and native-born populations. In 2017, roughly one-third (34 percent) of Korean immigrants held a bachelor’s degree, compared to 18 percent of the foreign-born and 20 percent of U.S.-born populations. Likewise, more Korean immigrants had graduate or professional degrees (20 percent) than other immigrants (13 percent) and native-born individuals (12 percent). Korean immigrants tend to be older than the overall foreign- and native-born populations. The median age of Korean immigrants was 48 in 2017, compared to 45 for the overall foreign-born population and 36 for the U.S. born. However, more Korean immigrants are of workforce participation age than U.S.-born individuals, with 77 percent and 59 percent, respectively, between the ages of 18 and 64 (see Figure 4). Korean immigrants participated in the civilian labor force at a lower rate (61 percent) than foreign-born individuals (66 percent). (For comparison, the native-born labor force participation rate was 62 percent.) Korean immigrant women were less likely to participate in the workforce (53 percent), compared to foreign-born (56 percent) and U.S.-born (59 percent) women. More than half of Korean immigrants were employed in management, business, science, and arts occupations, compared to just 32 percent of all immigrants and 39 percent of natives. In contrast, far fewer Korean immigrants worked in natural resources, construction, and maintenance occupations (3 percent) and production, transportation, and material moving occupations (8 percent) than the other two populations (see Figure 5). Korean immigrants tend to have higher incomes than both the foreign- and native-born populations. In 2017, the median income of Korean immigrant households was nearly $65,000, compared to about $57,000 for all immigrant households and $61,000 for U.S.-born households. In 2017, Korean immigrant families experienced poverty at a rate comparable to that of U.S.-born individuals (with just under 9 percent of each group living in poverty), but lower than the rate for immigrant families overall (14 percent). In 2017, most Korean immigrants were naturalized U.S. citizens. Of the more than 1 million Korean immigrants in the United States, 63 percent (nearly 665,000) were naturalized citizens. Sixty-two percent of all Korean immigrants entered the United States before 2000, 21 percent arrived between 2000 and 2009, and 17 percent entered after 2010 (see Figure 6). In 2017, more than 19,200 Korean immigrants became lawful permanent residents (LPRs). The majority (59 percent) obtained this status through an employer sponsorship, and slightly more than one-third were sponsored by immediate relatives of U.S. citizens. Almost no Korean immigrants were beneficiaries of the Diversity Visa Lottery or were refugees (see Figure 7). Notes: Family-sponsored: Includes adult children and siblings of U.S. citizens as well as spouses and children of green-card holders. Immediate relatives of U.S. citizens: Includes spouses, minor children, and parents of U.S. citizens. Diversity Visa Lottery: The Immigration Act of 1990 established the Diversity Visa Lottery to allow entry to immigrants from countries with low rates of immigration to the United States. The law states that 55,000 diversity visas are made available each fiscal year. Nationals of North Korea are eligible to apply for the diversity visa, but nationals of South Korea are not. There were approximately 169,000 unauthorized Korean immigrants living in the United States during the 2012-16 period, according to Migration Policy Institute estimates. They represented 1 percent of the estimated 11.3 million unauthorized immigrants in the country and about 16 percent of the total Korean immigrant population. Click here for an interactive data tool showing top states and counties of residence for unauthorized immigrants in the United States by country or region of origin. As of 2018, 29,000 unauthorized Korean immigrant youth were eligible for the Deferred Action for Childhood Arrivals (DACA) program, which provides recipients work authorization and relief from deportation. Since the launch of the program in 2012, 7,911 Korean immigrants have applied, and 7,425 (94 percent) of those petitions were approved, according to the latest data available from U.S. Citizenship and Immigration Services. Click here for two interactive data tools showing MPI estimates of DACA-eligible unauthorized immigrant populations for top states and counties, and application rates by country of origin. Korean immigrants were half as likely to be uninsured as the total immigrant population, but slightly more likely than the native-born population. In 2017, the majority (71 percent) of Korean immigrants held private health insurance, and they were more likely than both other groups to have private insurance. Conversely, they were slightly less likely than all immigrants and the U.S. born to have public health coverage (see Figure 8). In addition to the 1 million immigrants born in Korea who now reside in the United States, an almost equal number (920,000) were born outside of Korea—including in the United States—but reported Korean ancestry. Together, the two groups comprise close to 2 million Korean diaspora members in the United States in 2017. South Korea received $6.9 billion in global remittances in 2018, up from $6.2 billion in 2017. Remittances accounted for less than 0.5 percent of South Korea’s gross domestic product (GDP). In 2018, remittances to South Korea were nearly three times larger than in 1990, according to data from the World Bank. Source: MPI tabulations of data from the World Bank Prospects Group, “Annual Remittances Data,” December 2018 update. Department of Homeland Security (DHS), Office of Immigration Statistics. 2018. 2017 Yearbook of Immigration Statistics. Washington, DC: DHS Office of Immigration Statistics. Available online. Institute of International Education (IIE). 2018. Open Doors Report on International Educational Exchange. Washington, DC: IIE. Available online. U.S. Census Bureau. 2018. 2017 American Community Survey. American FactFinder. Available online. ---. 2019. 1850-2000 Decennial Census and 2010 and 2017 ACS. Accessed from Steven Ruggles, J. Trent Alexander, Katie Genadek, Ronald Goeken, Matthew B. Schroeder, and Matthew Sobek, Integrated Public Use Microdata Series: Version 5.0 [Machine-readable database]. Minneapolis: University of Minnesota, 2016. Available online. U.S. Citizenship and Immigration Services (USCIS). 2018. Number of I-821D, Consideration of Deferred Action for Childhood Arrivals by Fiscal Year, Quarter, Intake, and Case Status: 2012-18 (November 30, 2018). Available online. World Bank Prospects Group. 2018. Annual Remittances Data, December 2018 update. Available online.